A large meeting under the Chairmanship of Mr Jessop H.F. Hulton was held in January 1906 to consider the question of a Golf Club at Deane. Mr Hulton, a permanent member of Lytham St Anne’s Golf Club had been Captain in 1894-95 and he assured all present of his support and best service regarding the proposal to form a Club at Deane. A Mr Rosbottom made a detailed statement as to the desirability of an additional Club in Bolton, saying there was ample room for two Clubs and there would be no risk of injuring any similar organisation. The situation was described as being on the west side of the town with a grand slope and providing a fine view with accessibility from all parts. The 18 hole course would have advantages of natural hazards such as streams, ravines and other natural features. The course was approximately 6700 yards long and meetings were held with the farmers to tell them how the land would be used. The financial aspect was presented with an entrance fee of two guineas together with an annual subscription of an equal sum. Mr R. Farnworth submitted a proposal that a Club be formed, to be called “Deane Golf Club” which was unanimously approved of together with the appointments of Mr Hulton as President, Mr Gask as Treasurer and Mr Hart as Secretary. A temporary committee was then elected and the first AGM was held at the Commercial Hotel in Bolton on the 6th April 1906. The contracts for Foundations and for the Golf House were given to Mr Dickinson and golf staff to Messrs Wardle. Mr Farnworth was credited for inception of the movement. The Ladies Section held their first meeting in Fernihough’s Café in Bolton on Tuesday 13th February 1906. Lady Hulton was elected Lady President and Mrs Flitcroft, Lady Captain. Prior to the Grand Opening, Officials and Members alike played the course – this being beneficial in many ways, ‘tramping the turf’ – “good for the turf and the trampers” as quoted in the Bolton Journal 25th May 1906. Also caddies were trained up. The first Groundsman was a Mr Huckle, the son of a golfing father, late of Horwich and who came from the Salop County. The territory was acquired on a 21 years lease and Mr Lowe of St Anne’s came to fix the holes. The boundaries were described as Junction Road (running from Deane to Lostock Junction on the South), the Railway on the north and the Giant’s Chair near Ladybridge, though not all the land within the confines was included. Regarding the Club House, the Ladies were to have exclusive and special accommodation including a cosy chamber as sitting room with direct access to the caterers’ quarters. The gentlemen were to have smoking and tea rooms and a drying room. Approval was thus given for ‘The Deane Golf Club’. Opening Day Wednesday 20th June 1906. Tickets were available for the sum of one shilling and these were exchanged for badges on admission. The Opening Day, by all accounts, was a splendid Day with tea provided whilst a string band played selections during the afternoon. Photographs were taken by Mr N.S. Kay and at 3.o’clock Mr McEwen (Professional of Formby Golf Club) and Mr Simpson (Professional of Lytham & St Anne’s Golf Club) played a round on the links. At 5 o’clock Miss May Hezlett (an ex-Lady Champion) and Miss Florence Hezlett also played a round on the links. Unfortunately rain prevailed in late afternoon. At the Opening ceremony those present included Sir William Hulton Bart, Lady Hulton, Mr Jessop Hulton (President) and Mrs Jessop Hulton, the Messrs Haslett, Councillors A.T. Crook, J.P, .N. Fletcher, D. Maginnis, J.P., Messrs E. Farnworth, T.W.Shaw J.P., E. Walker J.P., J.H. Goulburn, W. Horrocks, C. Crook, F.W. Thompson, A. Entwistle J.P., B. Knowles J.P., F. Marsh, W. Booth, Noble W.R. Lythgoe J.P., A. Sparke, F.R.L.S., and a large number of other ladies and gentlemen. Mr Farnworth briefly called the company together opposite the Pavilion, and in the name of the Council of the Club asked Mrs Jessop Hulton to accept a handsome gold key with which to open the door of the Club House and to formally declare the links open. The key was designed by S. Wolfenden, D.B.H.I., Bradshawgate. From information received by Joyce Commins (Vera’s Buckle-Commins daughter-in-law), It is believed that Vera, William’s daughter, was born at Deane Golf Club on 19th June 1906 the day before the inauguration of the Golf Club. Vera celebrated her 100th birthday the day before the club celebrated its Centenary. Vera remembers being told that he was the first Professional at Deane but has nothing to confirm this. He only stayed at Deane a relatively short time and then moved to Gatley Golf Club. War broke out in 1914 and he joined up and was sent to France as a gunner. He was demobbed in 1918 when he moved to Leigh Golf Club at Culcheth. The Deane Club House was completely destroyed by fire on Monday 17th May 1915. The outbreak was discovered at about 10.50 a.m. and the alarm given to the Fire Station by telephone. Superintendent Bentley and his staff were soon on the scene with the motor engine. The building, a wooden structure, was by this time however fully alight. The brigade’s efforts were turned towards saving the caddies house and outbuildings and the adjoining farm of Mr Roberts. In this, they were successful although slight damage was done to the roof of the caddies house. The property, which was erected at a cost of £700, was partly covered by insurance. The cause of the conflagration is thought to have been a back firing of the gas burner belonging to the wash boilers. The fire was witnessed by a large number of people, and the event caused much excitement in the district. Temporary headquarters were established at New Brook House, Deane. Some five years later a solid brick building was erected and the new Club House was opened by Lady Beaumont on 29th May 1920. There was a large gathering for the Opening including many visitors from other Clubs and after the ceremony a mixed foursomes was played followed by a concert in the evening. 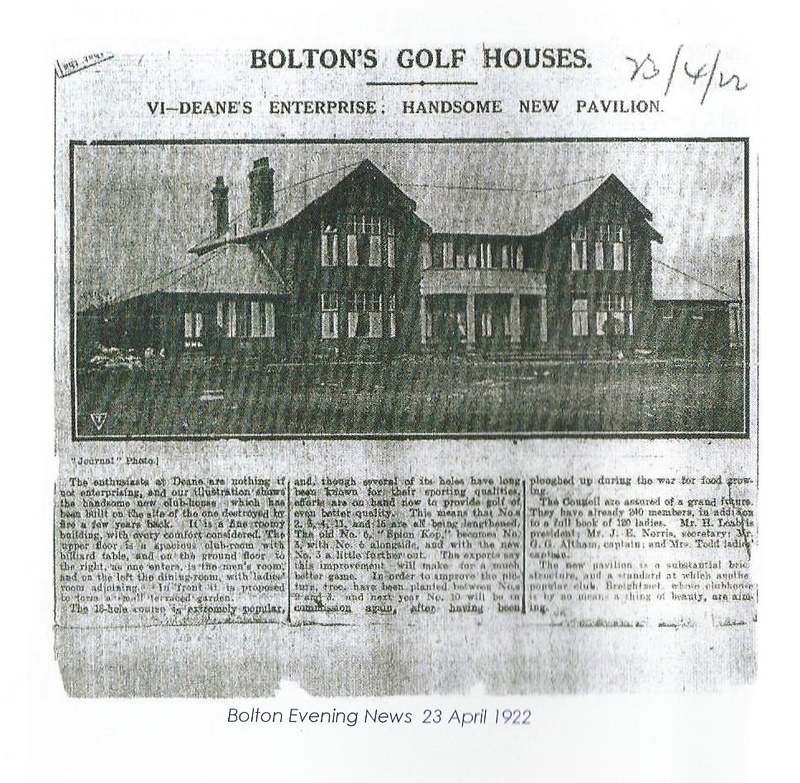 Some two years later the ‘new’ clubhouse was featured in the Bolton Evening News as shown in the following cutting…….